I recently ran into a problem where I had to maintain a set of projects in both VS.NET 2003 and VS.NET 2005. After struggling with this for a couple hours, I came up with a solution that seems to work. It is far from idea, because it involves having to maintain two copies of the project, but other than that (considerable!) defect, it compensates for Microsoft's inability to have solved this problem adequately. They still live in a delusional world in which the day on which a new product is released, all users instantly switch from the old version to the new version, and never find any problems that would require that they revert to the older system. Or have to maintain configurations that support both old and new builds. In the past, they were much better about this; but in the VS.NET2003-to-VS.NET 2005 transformation they completely lost the concept of backward compatibility, since the new system uses the same file names as the old system! I spent some hours fiddling with this and came up with a solution. Here are the steps I used. We are starting with a simple solution that has only one project. We are starting with solution file is called project.sln and the project file project.vcproj. 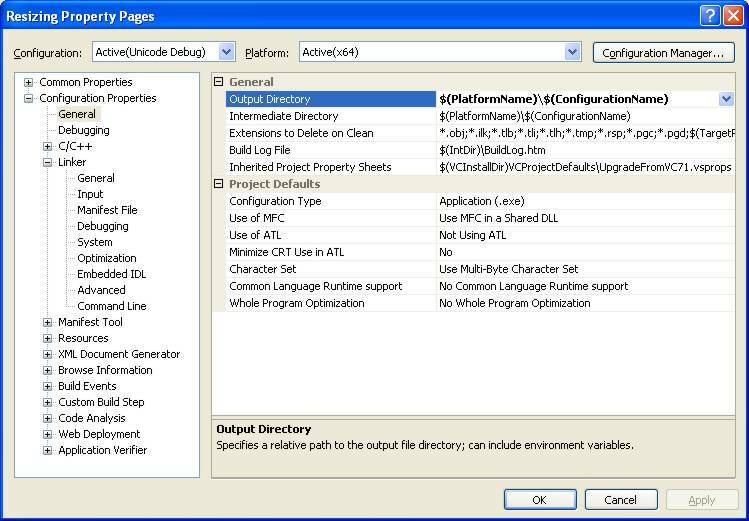 Invoke Visual Studio .NET 2005. In my case, I added the Win64 configurations. Note the Configuration Properties, General, Output Directory and Intermediate Directory properties of the Win64 configuration is $(PlatformName)\$(ConfigurationName). Highlight one of these and copy it to the clipboard. 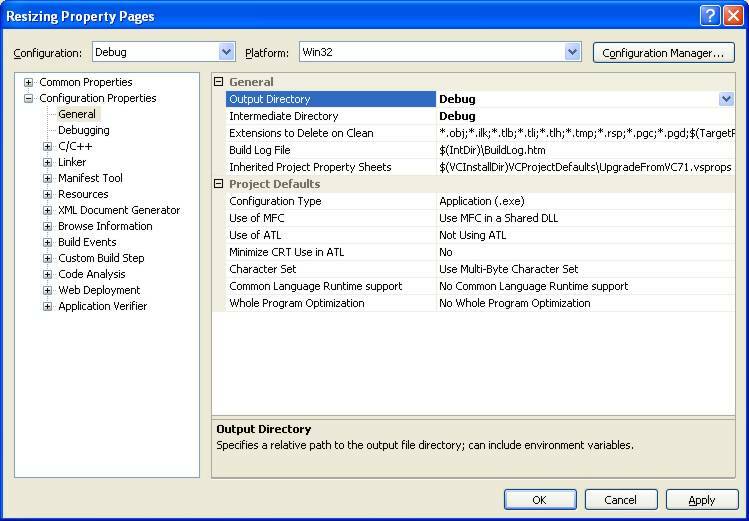 Note, however, that for the Win32 configurations, these properties are simply set to Debug. Repeat this process for each of the Win32 configurations, such as Release, and any others that you have. To build under VS.NET 2003, open the project.2003.sln file; to build under VS.NET 2005, open the proejct.2005.sln file. Of course, the obvious problem here is that I now have to maintain two project files, but I can build all twelve configurations.easily. Four builds (debug, Unicode debug, release, and Unicode release) built with VS.NET 2003, four 32-bit builds (of the same designations) built by VS.NET 2005, and four 64-bit builds (of the same designations) built by VS.NET 2005.